Mooloolaba is one of my favourite weekend getaway places. What I love about it is its chilled atmosphere, the boutiques along The Esplanade, and of course its restaurants. Restaurants have come and gone in the last few years. A few of my favourites have been replaced by something else and it is a little disappointing to see what was once my favourite is no longer there. Nevertheless, it also brings excitement as to what the new place might offer. The above, however, does not apply for Augello's Ristorante & Pizzeria. First established in 1995, they continue to grow in popularity. Whenever I walk past this restaurant, it's always so busy, vibrant and crowded. Specialising in modern Italian cuisine, it is open 7 days for lunch and dinner with take away and home delivery services. With two levels of alfresco dining and spectacular ocean views from the upstairs balcony, this multi-award wining restaurant is a favourite among the locals as well as tourists. My husband and I booked days in advance to ensure we get a table as weekends are specially busy. As it was my first time at Augello's I was quite curious as to what their menu offered. I opened up the menu and I panicked. There were so many options! Pastas, risottos, calzones, salads and pizzas. What on earth am I going to order? Each one was screaming "Pick me! Pick me!". I ended up picking the one I know and love - Spaghetti Marinara with cream sauce. My husband ordered the Mount Vesuvius pizza which had tomato, cheese, bacon, hot salami, roasted peppers, onions, capers and fresh chilli. And of course, we can't forget the garlic bread. I must say, it certainly did live up to our expectations. It was just amazing! The seafood in my marinara was fresh, cream sauce not too overpowering, and spaghetti al dente. The Mount Vesuvius pizza was beautiful. It might have looked like an ordinary pizza on paper, but it did not taste like one. In fact, it was flavoursome, scrumptious and succulent. Our original plan of taking away our left over pizza (as we ordered a two-person pizza) went out the window! Overall, we had a blast: awesome food, great company and served by attentive staff. It may seem a bit crowded in the downstairs seating area as the tables are placed quite close to each other, but you forget about that once you sit down. Also, if you're a coffee fan, they do awesome coffee as well. 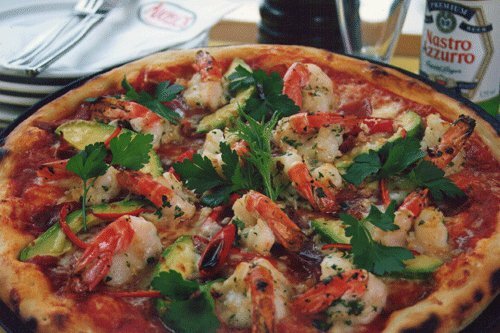 So if ever you're in Mooloolaba, be sure to visit Augello's Ristorante & Pizzeria. I agree! We found this place by accident and now every time we are at the North Coast, we go back!!! Fantastic food and attentive staff.